A short walk over High Rigg near St Johns in the Vale. The path north from the A591 leading you round to St Johns Church. A view north west to Latrigg and Skiddaw which is lost in the cloud. A view back to Castlerigg Fell and Goat Crag. Further along the path this view of Castlerigg Fell has a lovely shape to it. A view over St John's Church to Low Rigg. Blencathra to the north east. Threlkeld Knotts and Clough Head. Tewet Tarn and the Glenderaterra Valley. Another view of Blencathra from higher up. Clough Head and the gully to the right is Fishers Wifes Rake. The rock summit of High Rigg looking south to Thirlmere. The cairn next to the rock summit. Here we are walking south along the fell to the Birkett Summit. The highest point over there is the true summit of High Rigg. 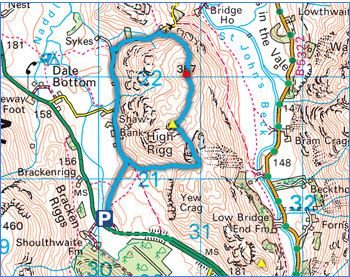 The Birkett Summit of High Rigg (Naddle Fell) at 343m above sea level. The view south to Thirlmere, Great How and Benn Man. No cairn on this summit. This shows the view north. From here we dropped down to the west to rejoin the path from earlier.